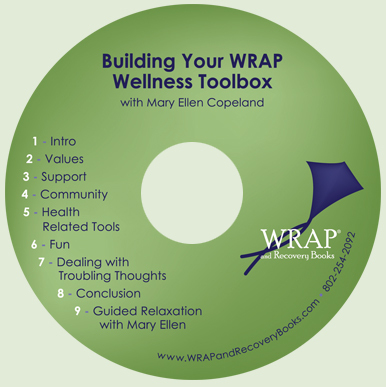 In this audio CD, Mary Ellen Copeland will help you build your Wellness Toolbox ̶ the cornerstone of building your WRAP. The Wellness Toolbox contains a personal listing of all the tools you have at your disposal to help you feel better and stay well for life. Your Toolbox is used to develop action plans for all the parts of your WRAP – from your Daily Maintenance Plan through your Post Crisis Plan. This audio CD guides you through the process of uncovering your personal Wellness Tools and includes many ideas that you can add to your Toolbox if you think they would work for you.